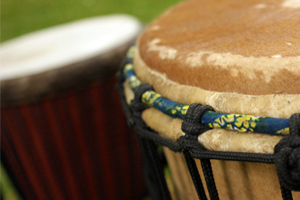 Drumroots Djembe Class is Back for 2012. After a well deserved Christmas break the drumroots team are back with Manchester's longest running West African drumming class. These mixed ability workshops are suitable for total beginners right through to advanced djembe players. The year will start with a run of workshops focusing on Malinke rhythms from the North East of Guinea specifically Kouroussa and Sanbaralla, home of Famoudou Konate one of the worlds most renowned djembe masters. For 2012 we will see more classes focused on the dun duns and with even more support from the members of the performance group Tanante. African dance classes with Sens Sagna are back too. Learn choreography, solo dance and traditional Senegalese songs in this fun and friendly environment. Again with support from Tanante. A great way to learn African culture and keep fit!